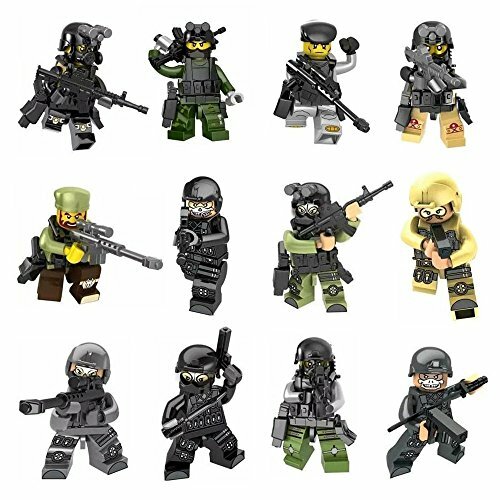 Set Includes 12 Mini Force SWAT TEAM Figures, Tank Unit, Weapons, Plus Military Accessories. Each of the 12 minifigures comes in its own bag with some weapons accessories including Flags & Symbols. This product is safe for ages 5 and up. Miniigures measure about 2 Inch H and perfectly work with all other major brand pieces but may not with Duplo. This Toy Soldiers Set from AMEI are made of nice quality material. Plus, figures can bend, sit, stand, turn their heads,and can move their arms and legs! Toy safety is very important for AMEI.That\'s why we test all our children\'s toys to ensure quality, safety and durability. The toys we sell are in full compliance with all u. S. Safety laws, as we want to ensure the children using our toys are kept safe! This product is safe for ages 5 and up. Figures measure about 2 inch h and perfectly work with all other major brand pieces.